Logan Freaking Quinn.I'm right there with you, Gwen. Not a whole lot can really beat LFQ, although hanging out with a bunch of flying gryphons comes pretty close!As if the talking sword and the wolf as a pet weren't awesome enough, the "Stacia really wants one of those" factor was increased with the addition of gryphons. WHY CAN'T I HAVE A GRYPHON??? That Gwen Frost gets everything. Never mind that evil beings are trying to kill her at every turn, because she gets cool toys. And Logan Freaking Quinn. Sometimes life is a trade-off. Danger for all the swag, right?These books are so much fun. I don't get near enough fun in my book-reading life. I need more crazy adventures with mythical creatures, apparently.Daphne's black eyes fixed on the dead reapers. "So," I asked. "How was breakfast? "Daphne arched an eyebrow. "Obviously not as exciting as yours. "This installment of the Mythos Academy series surprised me. I was happy to see much less repetitiveness of character descriptions this time around. Estep's writing appears to have been been polished up quite a bit, of which I wholeheartedly approve.I wasn't happy with having to wait SO darn long to see Gwen's my Logan (before you start worrying that I have strange creeper tendencies, I always picture book characters as older than they are), but when he showed up, he showed up in a big way and made the wait worthwhile.One of my favorite things about Midnight Frost was getting to see everyone pulling together as a team, even more so than they have in the past. Nickamedes has inched his way into my heart, so it was sweet to see Gwen really pulling for him. In a way, this band of misfits has become their own sweet little family and I love it. 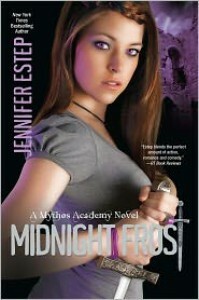 I can't wait to see what everyone else has to say about Midnight Frost. Those of you who have been reading along so far, I'm hoping that you'll enjoy this as much as I did. The start was a little slower than I would have liked (which seems to be a weird thing about this series in general), but the second half of the book was great. Those of you who haven't been reading and like mythology and adventure, put this series on your list. It can be fluffy at times but sometimes that's okay - especially when you're having too much fun to care.This book provided from the publisher in exchange for an honest review. All quotes were taken from the pre-published copy and may be changed or omitted from the final copy.